What Next For Labour? Ideas for a New Generation. Edited by Tom Scholes-Fogg and Hisham Hamid. Queensferry Publishing. 296 pages. September 2011. Since being removed from power in 2010, the Labour Party has been engaged in a process of self-renewal. Ed Miliband has been undertaking a wholesale policy review across the party, while those more widely affiliated have also been contributing to the debate through the blogosphere, newspaper column pieces, through think-tanks, and at a grass-roots level. The central questions of this debate remain what Labour did wrong to cost itself the 2010 election, and what the party must now do to make itself electorally viable again. 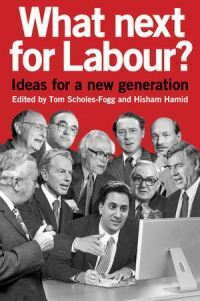 Edited by Tom Scholes-Fogg, a Labour activist and blogger, and Hisham Hamid, an ex-Liberal Democrat supporter who defected to Labour after the 2010 election, What Next for Labour? Ideas for a New Generation is a timely contribution to this debate. Bringing together contributions from Labour MPs and Peers, as well as those involved with the party more widely, the book offers an array of opinions on what Labour could seek to do across a number of policy areas in order to regain support. In their introduction, Scholes-Fogg and Hamid provide a concise audit of the New Labour years and detail some of the problems the party now faces. It is hard to deny that after 13 years of New Labour Britain is not a better place, they write: “Crime down by a third, more police on the streets, the New Deal, the minimum wage, civil partnerships, devolution, peace in Northern Ireland, investment in education and the NHS, Sure start, Child tax credits and the Winter Fuel Allowance. The list of Labour achievements goes on”. Various criticisms are also listed, including the Iraq war and failures on immigration and the erosion of civil liberties. Labour’s handling of the economy is listed as an area of complacency rather than an outright criticism. From here the book explores various areas of policy such as defence, health, transport, justice, law and order, and enterprise and business, alongside other articles on campaigning and party structure. The policy and sector-based articles in the collection are rich in their analysis, especially James Frith’s piece on what a more dynamic Labour economic policy may look like. With not a single business leader backing Labour at the last election, Frith suggests that clearly one of the challenges Labour has is the need to “broaden its conversation with business” in order to get a better understanding of what business wants from government. Frith suggests that from this conversation Labour will come to understand that what SME’s in particular want is not necessarily Conservative pro-business prescription of tax cuts and supply-side economic reform, but that they primarily want access to finance and state investment to support growth in their sectors. To answer these challenges Frith puts forward the compelling idea of a more “digital Keynesianism” which focuses on SME’s in globally competitive industries such as the digital, high-specification technical, and green futures sectors. These sectors are the best placed in the global economy “to reward high levels of investment with high levels of growth and increasing employment”, he suggests. Dr Rupa Huq’s piece recognising the importance on the extent to which suburban voters and their concerns will be the key to electoral success after New Labour is also intriguing, particularly as all three major parties continuing to strongly court the ‘squeezed middle’ voter group as part of their electoral strategies. Despite this, Huq posits that the squeezed middle remains a term in flux and this should have significant implications for any electoral strategy which seeks to court this base in the next election. On the one hand she highlights that suburban voters clearly still clutch around issues such as aspiration, immigration, and law and order, emphasised by the example that Labour’s ‘A future fair for all’ slogan did not appeal to suburban voters’ base instincts in a way that the Conservative’s policy of inheritance tax changes did in 2010. On the other hand, Huq also highlights that “modernity has taken its toll on the suburbs”. Suburban Britain is now increasingly ethnically diverse, and attitudes are now increasingly social liberal. Rather than treating middle Britain electorally as an undifferentiated mass, Labour must seize the initiative to appeal to this new suburban make-up. As Huq highlights the lack of traction that Conservative plans for marriage tax breaks are receiving may serve to highlight the pitfalls of viewing middle-Britain in more traditional terms. Intriguingly, both Frith and Huq appeal to more localist politics in which the role of the state is perhaps less prominent than has been in previous Labour party narratives. Joseph Russo’s chapter on Co-ops and New Labour gives further structure to this. Russo suggests that a mutalist approach which seeks to provide local solutions to local problems may be the real alternative for providing a credible Labour narrative which ‘empowers the working classes, whilst reassuring the middle classes’. Many of the contributions, particularly the economic ones, contain an implicit narrative akin to the ideas put forward in The Purple Book published in 2011. Authored by the centre-left thinktank Progress, The Purple Book explored how Labour’s more decentralist tradition could become more applicable in an age of austerity. Scholes-Fogg and Hamid clearly sympathise with a need to at least in part move away from Labour’s more statist traditions, when they highlight that a legitimate criticism of New Labour’s economic record “was the attitude that if money were thrown at public services then they would improve de facto”. What next for Labour? is thus perhaps best conceived of a reiteration of many of The Purple Book’s ideas and key themes, as well as providing some useful suggestions for more specific policy areas such as transport, health and defence. While the book doesn’t add anything ground breaking to the current Labour policy debate, it clearly reiterates the fact that the Labour party as a whole is taking seriously the mistakes it made in Government, and is thinking innovatively about the challenges that economic austerity presents. In fact, this volume may compound the view held by many commentators at present that Labour’s recent poor polling is largely down to issues of communication and presentation, rather than a lack of ideas. This review was first published on the LSE British Politics and Policy blog on 11th March 2012.